In pursuing its strategic objectives and in delivering quality services to ISSA member institutions, the ISSA Secretariat is committed to the values of empathy, integrity, openness to change and service quality. To ensure accountability, transparency and good governance, the ISSA Secretariat is guided by the ISSA Good Governance Charter and the ISSA internal control standards. Since 2010, the ISSA Secretariat quality management system is ISO 9001:2008 certified. The General Assembly, actually the constituent assembly of the Association, is the highest statutory body, in which all members of the ISSA are directly represented. It sets the terms of the Constitution, which establishes the framework for running the ISSA, and can decide to dissolve the Association. As a general rule, the General Assembly meets every three years. The Council constitutes the electoral body of the Association, composed of the titular delegates of each country in which the ISSA has at least one affiliate member, with each of these countries having one titular delegate. In particular, its main functions are to elect the President, the Treasurer and the members of the Bureau and of the Control Commission, as well as the Secretary General. In addition, it sets the programme of activities and the budget of the Association, which are established for a three-year period, as well as the corresponding contribution rates. As a general rule, the Council meets on the occasion of each session of the General Assembly. The Bureau constitutes the administrative authority of the Association, composed of the President of the ISSA, the Treasurer, the Secretary General, and elected members representing the different geographical regions of the world. In particular, its main functions are to define the plan of action, the timetable and the guidelines to be followed in drawing up the programme of activities and budget of the Association, to set programme priorities, to monitor and evaluate actual accomplishments, to rule on membership applications and to adopt the financial regulations. Another essential function consists of establishing the structure of - and deciding upon the mandate of - the Technical Commissions necessary for carrying out the Association's programme of activities. The Bureau meets at least once every calendar year. The Control Commission examines the financial records of the Association and the annual report and statements presented to the Bureau by the Treasurer, and verifies that all financial transactions have been carried out in conformity with the Financial Regulations. The Control Commission submits a report to the Bureau on its findings and makes observations and recommendations. Members of the ISSA Control Commission meet in Geneva, February 2017. 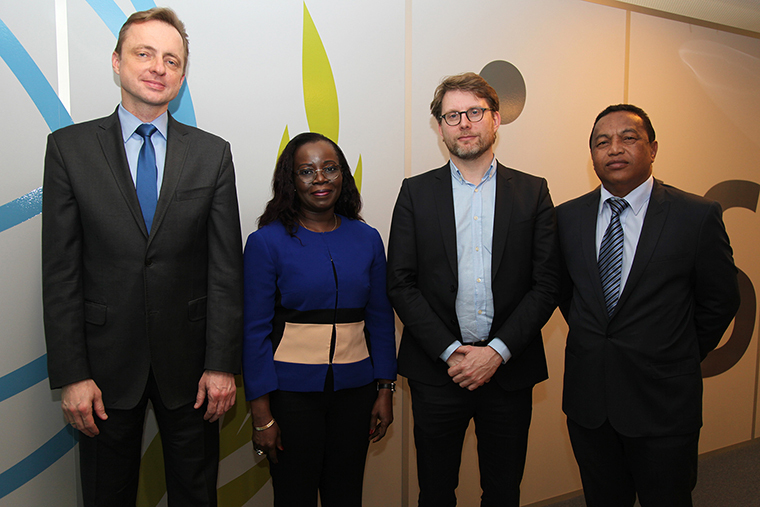 From left: Mr Pawel Jaroszek, Poland, Titular Auditor; Ms Patricia Koizan, Côte d'Ivoire, Titular Auditor; Mr Jean-Marc Vandenbergh, Belgium, Titular Auditor and Chairperson of the Control Commission; Mr Raoul Romain Arizaka Rabekoto, Madagascar, Deputy Auditor.